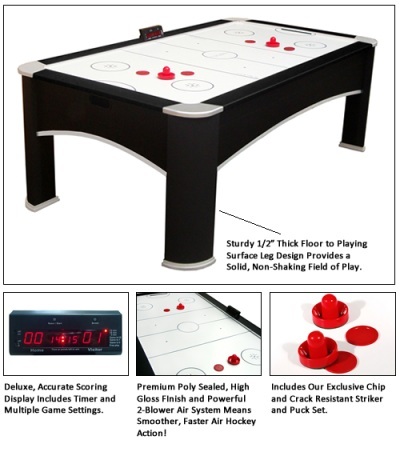 Free shipping to the lower 48 United States for this table hockey game table. 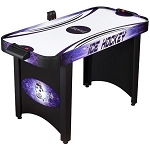 A great addition to any home game room, this large air powered hockey table improves on many aspects of table hockey game product. First, the large size of this table provide ample playing area: about 82 inches L x 40 inches W - so that the game has many more playing angles and possible shot outcomes than smaller-sized tables. Second, many hockey game tables have only a 1/8 inch thick playing surface; this table has a 1/2 inch thick playing surface. Lastly, the electronic scorer for this table has multiple game settings to help cater the game style to your needs and time. Order your air-powered table hockey game here. Playing surface material of construction: MDF board. 2 110 V blowing motors provide smooth, consistent playing surface. Table top is covered in premium poly sealed glossy laminate to help reduce friction. Comes with 2 strikers and 2 pucks. Ships via an LTL freight carrier. All top rails, corners & legs feature sturdy "CAR"? certified construction with attractive black and silver laminate, no cheap particle board. Comes with a 90-day limited warranty from the manufacturer. Convenient hinged side aprons for quick easy assembly. Assembled dimensions: 90 inches L x 48 inches W x 32 inches H.
Playing surface dimensions: 81.75 inches L x 39.75 inches W.
Table top thickness: 1/2 inch. Striker dimensions: 3.75 inches in diameter. Puck dimensions: 3 inches in diameter. This hockey table is delivered via an LTL freight carrier (via semi truck) for a curbside delivery. This type of delivery means that the customer must be present to sign for the delivery and take the product off the truck; the driver will not assist. Delivery appointments are scheduled by the delivery company before the delivery occurs. Most products, including this hockey table, can be removed off the truck easily by 2 or 3 people. However, if you need additional services, such as a lift gate to lower the product to the ground, additional charges will apply. Please let us know if you would like a quote on these additional services and we will get you pricing specific for your delivery location. Dimensions: 93" x 52" x 12"